The UK electricity system is about to undertake a much-needed transformation, as innovative technology disrupts traditional models from generation to energy usage ‘behind the meter’. These changes are required to our national electricity infrastructure because the UK is entering a very exciting time with increasing levels of renewable energy being generated across the grid and rising electricity demand with electrification of vehicles and heating within buildings. This is however happening at the same time the UK is losing approximately 22GW of energy from ageing coal-fired power stations, and 8.8GW of energy from nuclear power stations (https://extremelowenergy.com/uk-ageing-power-stations-being-turned-off/) meaning an alternate decentralised energy plan is required. Renewable energy sources have grown dramatically in recent years, but the intermittent nature of renewables means this is not a viable way to fill the gap without being able to ‘buffer’ the energy for when it is required. The grid we currently have has evolved to channel electricity from a small number of big power stations to a large number of final users and therefore the distribution networks in particular have been designed for a one-way flow of electricity. These design constraints combined with transmission losses, power factor & harmonics issues mean the amount of renewable energy available for use via the grid is substantially reduced. Our aging electrical grid just isn’t capable of integrating centralised renewables into our energy use without so much potential power being wasted. As more decentralised renewables come online, the need for storage will become increasingly acute. Without storage, when too much electricity enters the grid on sunny days, windy nights or days with reduced demand, supply exceeds demand and negative pricing occurs. Energy storage adds flexibility to the system, allowing the electricity to be stored and discharged later when needed – for example in evening hours or during times of peak demand. Thus, energy storage offers a way to remove demand off the grid and flatten out the peaks and valleys of supply to prevent disruptive economics and make energy efficiency projects much more viable. By using localised energy storage within energy efficiency projects means that further benefits can be gained such as the Security and lighting projects we are delivering at ELe where the LED lights are powered directly from stored ‘direct current’ in battery banks and not having to be convert or transform electricity from AC to DC or vice versa. These benefits can mean the removal of unnecesary devices such as LED lighting drivers or power supplies which will deliver future maintenance and operational savings for the projects. Generating DC power locally from dedicated solar panels and using the electricity locally in electronic devices such as LED lghting, computers, tablets, phones etc.. also increases efficiency and minimises the losses over grid connected projects therefore increasing the returns for new projects that are no longer subsidised in the same way with government feed-in tariffs. 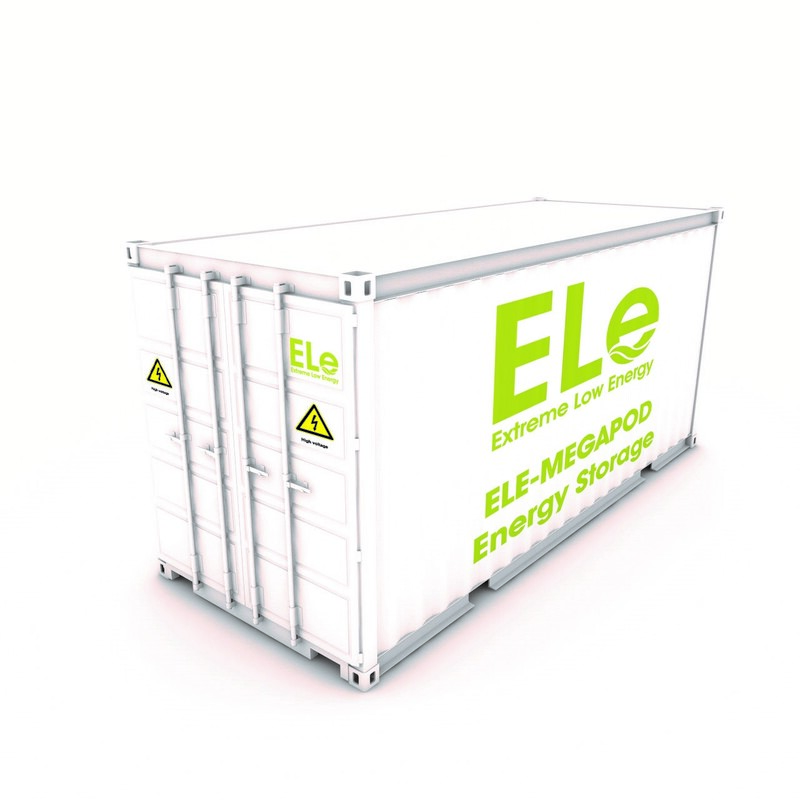 Extreme Low Energy / ELe® is a specialist manufacturer of patented low voltage infrastructure. ELe offers a range of unique and innovative, end-to-end connected electrical solutions, including LED Lighting, ICT & Security systems. 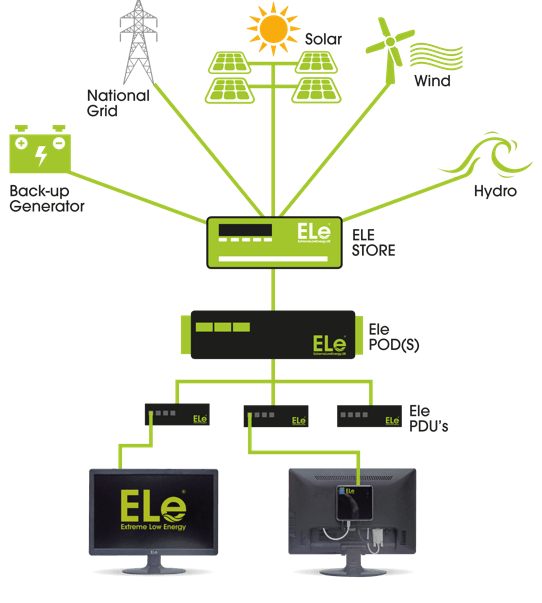 ELe’s technology enables businesses to operate partially or fully off-grid, monitor & manage their power consumption and gain substantial savings in energy costs and carbon emissions. Copyright 2016 Extreme Low Energy Ltd - aka Ele. All Rights Reserved.